This recipe works just as well with broccoli instead of Brussels sprouts if your family aren't sprout fans. 1. Preheat the oven to 200°C/gas mark 6. Grease a gratin dish with a little butter. 2. Bring a large saucepan of salted water to the boil. Add the Brussels sprouts and blanch for 3 to 4 minutes, until they are bright green and tender. Lift the sprouts from the water with a slotted spoon and drain in a colander. Add the cauliflower florets to the same pan of boiling water and simmer for 5 to 6 minutes, until softened. Drain and transfer both to the prepared gratin dish. 3. Meanwhile, melt the butter in a saucepan set over a medium heat, then stir in the flour. Cook for about 2 minutes, until the roux is a light golden colour. Pour in the milk and whisk vigorously until smooth. Bring the sauce to a simmer and cook for 5 to 6 minutes. Remove from the heat and add the grated cheese, stirring until melted. 4. 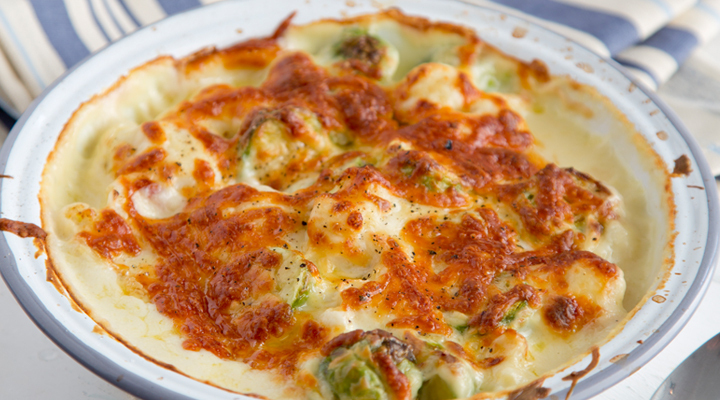 Pour the sauce over the vegetables in the gratin dish and season with salt and pepper. Place the dish in the oven and bake for 10 to 15 minutes, until golden. Serve immediately.